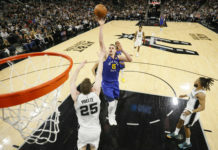 The Denver Nuggets appear to be a potential player this off season in some sort of move to bolster the team’s talent –whether that move be big or small — to make a playoff push in the 2018-2019 season. With assets to move, a very trad-able No. 14th overall pick and a lot of young talent, the Nuggets have options. Could one of those options be Kawhi Leonard? Reports from Yahoo Sports! Shams Charania made it very clear on Friday. Leonard wants out of San Antonio. Could Denver be a destination? The Mile High Sports Radio team was quizzed on the idea of acquiring Leonard, but at the cost of the team’s budding star in Nikola Jokic. Would you entertain a trade that involves Jokic for Leonard? I’d certainly entertain it – but I’d have to be assured that Leonard is a) healthy, and b) willing to sign a long-term deal with the Nuggets. The Nuggets would be crazy to go after Leonard. Denver has a guy like Leonard in Gary Harris. I’m not saying Harris and Leonard are equals, but Harris’s game can grow close to that point with proper coaching. It would also cost Denver way too much to get Leonard. Pass. If the Nuggets are assured Kawhi Leonard is healthy and willing to sign a long-term deal with the Nuggets, you make the deal yesterday. Leonard is a superstar and Denver doesn’t have one. He drastically increases the Nuggets biggest weakness on defense and finally puts an alpha-male in Denver basketball, something Denver’s searched for since Carmelo Anthony. It’s time to stop overvaluing homegrown talent and reach out for a bona fide superstar. A talented assisting big-man who can’t play defense for a defensive superstar forward, who has been there, done that? Has scored 25+ PPG in a season when healthy? Can’t sign on the dotted line fast enough. Yes. There are few players in the NBA you would give him up Jokic for and that’s one of them. Leonard makes the Nuggets a playoff contender and potentially a player to go deep into the playoffs. Kawhi Leonard is a proven superstar. Jokic is not. This is as much a no-brainer as the rumored Murray-Irving deal. Saif Khan – Co-Host of The Wheelhouse. Sunday’s 8-10am. No way. 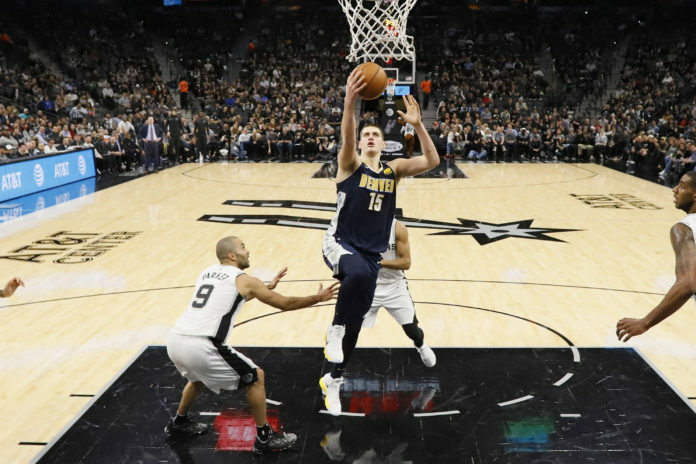 Nikola Jokic has finally started to hit his stride and become a major strength, if not the best player, for the Nuggets. A trade would make no sense. Kawhi has also dealt with some very worrying injuries that could linger. Is this really a question? ABSOLUTELY. If there’s a shot at bringing Kawhi Leonard to Denver, you do it. One. Hundred. Percent. Dreaming big about LeBron James coming to Denver is great and all, but in reality, Kawhi Leonard would be the next best thing. 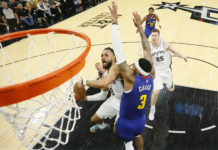 He can play the two or three, which is exactly what the Nuggets need from a positional player standpoint in order to upgrade from Wilson Chandler. 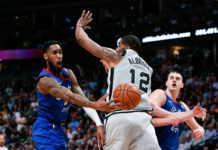 He can score and play well within an offense, but best yet is that he’s a phenomenal defensive player – and the Nuggets need that as much or more than anything. I’ve been on record as saying if push comes to shove, I’d take Leonard over Nikola Jokic. Ideally, they play together, but some how, some way, you get Kawhi Leonard here if you can. He’s a bona fide super star, something the Nuggets still lack. No. Jokic has a higher ceiling and is a more special player due to his 6’10” size. David Johnson – Producer at Mile High Sports.